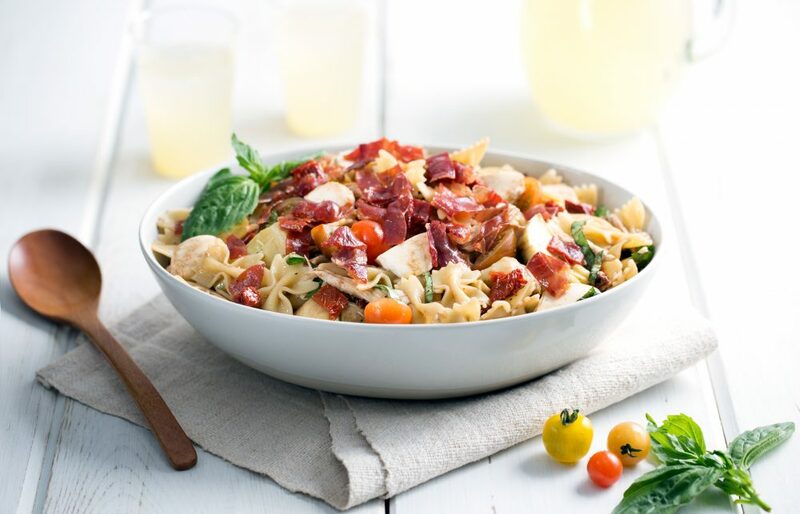 Cold pasta salad is the epitome of side dish perfection during the warmer months, so this Balsamic Chicken and Prosciutto Pasta Salad is just what your tastebuds are waiting for. The freshness of the tangy balsamic pairs effortlessly with the heirloom tomatoes and mozzarella, all while accentuating the savory chicken and Prosciutto di Parma. This prosciutto pasta salad is a great accompaniment to grilled summer dishes, or can easily stand alone as a main dish. Serve with a refreshing glass of lemonade or take a look at some of our favorite Prosciutto di Parma wine pairings to complete the meal. In a large non-stick skillet over high heat, cook prosciutto until crispy, about 5-7 minutes. Set aside. In a large serving bowl combine olive oil, vinegar, mustard, kosher salt and pepper until blended. Add cooked pasta, bocconcini, artichoke hearts, chicken, heirloom tomatoes, sundried tomatoes and basil tossing until evenly coated. Top with reserved crispy prosciutto just before serving.